My high school reunion is a school-wide event that happens every five years. It includes a 5k race, which in past years I didn’t run, because I wasn’t a runner then and the idea of running 3.1 miles (or walking 3.1 miles) was a bizarre concept. So 2010 was my year to see all my old pals AND run the reunion race. I’ll be honest, the course sucked. The first mile was uphill, which is something I didn’t even think was possible on the plains of the Texas panhandle. The weather also pulled a fast one on us that day. Instead of typical dry heat and wind, we had still hot humidity. When we lined up at the start, I ended up near the front, so I was ahead of most of the field for most of the race. I barely barely made it to the top of the long hill. The only aid station was at the top before we turned off onto a section of highway, but I didn’t stop. (I don’t typically stop for water unless I’m running 10k or further.) I had to shuffle along a bit during that second mile to get my breath back, but what goes up must come down: the last mile was a quick one back down to the finish, with just a slight uphill turn right at the end. 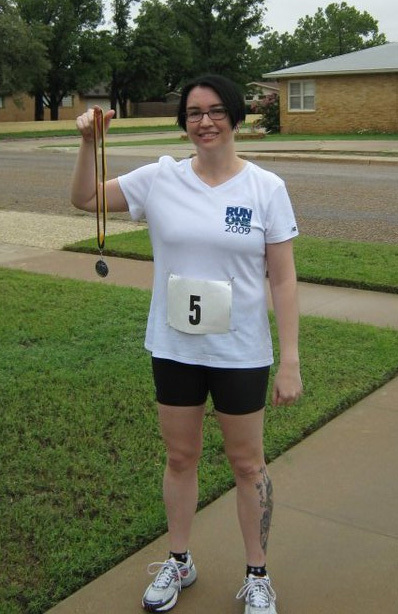 I ended up second in my age group and earned my first medal. (I had won a plaque in a previous race, but somehow medals are cooler.) And I PRed–ending with a time of 28:35. Now here’s the sad part: a man died at the race! After I finished, I went inside the community building that was the race staging area and got some water and fruit. When I got back outside, there was a man laying just past the finish line and the race director was running over to him. Luckily, there were a couple of people who knew CPR, so they began helping him breathe right away while an ambulance was called. The ambulance arrived in just a few minutes and they continued CPR, then used a defibrillator on him and eventually took him away to the hospital. He never re-gained consciousness. Apparently, the man had collapsed early in the race and another runner offered to help him back to the community building. He declined and finished, then collapsed again at the finish. I hope he didn’t have any pain, but I wish he had stopped at his body’s first warning signs and been checked out. I hope I would do the same.